Applegate Farms, LLC, the nation’s leading natural and organic meat company, today announced it is teaming up with Whole30® to bring The Clean Slate Café, the first-ever pop-up dining experience serving only Whole30 Approved® and compliant options, to New York City for a three-day event. Opening to the public on January 23rd, The Clean Slate Café will fuel attendees with complimentary meal, snack, and drink options that are made with clean, simple ingredients from Applegate, Spindrift, Kettle & Fire, Primal Kitchen, CHOMPS and Vital Farms. Millions of people have participated in the Whole30 program, a nutritional reset that eliminates added sugar, grains, legumes, alcohol, and dairy for 30 days. When hitting the food reset button, eating out and buying packaged foods and beverages can be tricky. The Clean Slate Café will offer something for everyone – from the person who resolved to cut or reduce their sugar intake in the New Year, to the “less is more” ingredients enthusiast. When Applegate kicked-off its partnership with Whole30 in January 2018, the success of the collaboration was immediate. This year, Applegate will be rolling out four new Whole30 Approved® products, growing its Whole30 Approved® product offerings to more than 35. The Clean Slate Café menu will pair Applegate favorites like natural and organic bacon, burgers, and hot dogs with Primal Kitchen dressings and condiments and Vital Farms eggs to create customized cauliflower rice or kale-based bowls, or delicious collard wraps filled with Applegate’s new and improved carrageenan-free deli meat. Attendees can also try a savory chili recipe from the Whole30 Slow Cooker cookbook, which uses APPLEGATE® No Sugar Bacon and Kettle & Fire’s Beef Bone Broth. Drinks will all be provided by Spindrift, the first sparkling water made with just real squeezed fruit. Delicious free range meat sticks from CHOMPS will also be served. 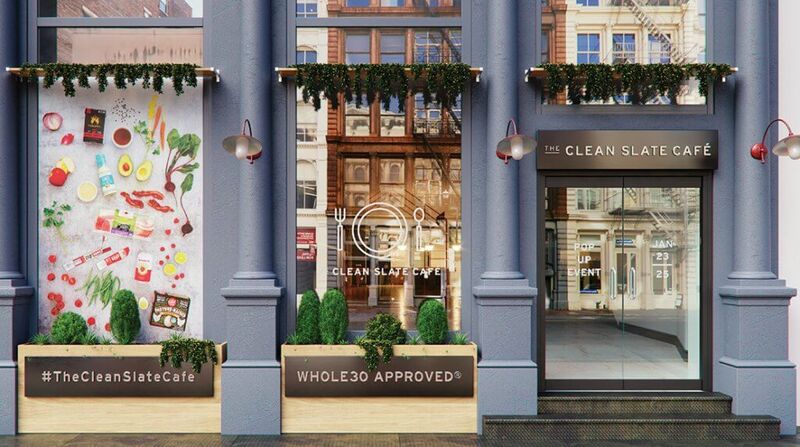 Located in the SoHo area at 446 Broadway (between Grand St & Howard St.), New York, NY 10013, The Clean Slate Café will be open to the public January 23 – January 25 from 11:00am-3:00pm and 4:30pm-6:30pm. Space will be limited and attendees are encouraged to register for a free ticket in advance. Ticket holders will be granted preferred entry, and the first 250 people to register for a ticket will receive a Whole30 compliant swag bag upon arrival with ticket confirmation and photo ID. For more information about The Clean Slate Café and to register for a free ticket visit whole30.com/the-clean-slate-cafe. About Whole30: Whole30® has been changing lives since 2009, when Melissa Hartwig blogged about her 30-day life-changing dietary experiment. Since then, millions of people have transformed their health, habits and relationship with food through the Whole30 program, eliminating cravings; improving energy, sleep, and mood; and losing weight healthfully and sustainably. The Whole30 website currently serves 2 million unique visitors a month, with readers checking in from more than 100 different countries, and has a combined social media base of more than 3 million fans and followers. Let Melissa and the Whole30 team help you discover the perfect diet for you: a nutrition plan that is balanced, sustainable and keeps you looking, feeling and living your best. Free of artificial ingredients or preservatives. Applegate became a subsidiary of Hormel Foods in July 2015. For more information about our products, visit www.applegate.com or talk with us on www.facebook.com/applegate, instagram.com/applegate or twitter.com/applegate. The Clean Slate Café is the first-ever Whole30 Approved® pop-up dining experience, serving up crave-able foods made with clean, simple ingredients. Presented by Applegate Farms, LLC, the nation’s leading natural and organic meat company, in collaboration with Whole30®, the 30-day dietary reset, The Clean Slate Café’s featured brand partners are: Spindrift®, America’s first sparkling water made with real, squeezed fruit; Kettle & Fire, the first and only eco-packaged bone broth; Primal Kitchen® uncompromisingly delicious condiments, dressings and more, all made with nutritious ingredients; CHOMPS® 100% clean, on-the-go, free range meat sticks; and Vital Farms®, the leading producer of pasture-raised eggs in the country offering a range of ethically sourced products nationwide. For more information about The Clean Slate Cafe, visit whole30.com/the-clean-slate-cafe or follow along on social media using #TheCleanSlateCafe.